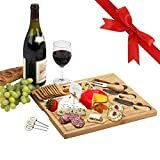 Elegant bamboo cheese board set includes a removable ceramic dish for crackers, olives, etc. and three cheese service utensils. Utensils are stainless steel with bamboo handles; (1) Cheese Knife (1), Cheese spreaders (1), Cheese fork - all inset in cheese board. Lifetime Warranty.